To the unpracticed eye, it was getting nearly impossible to tell one year’s GT from another with only minor changes from 1987-1990. 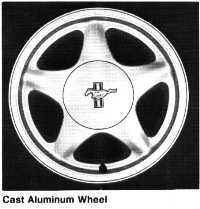 Ford changed that for 1991 with the addition of attractive new 5-spoke 16x7 inch aluminum wheels sporting the classic tri-bar running horse logo. 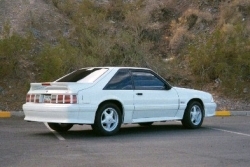 Even with the addition of new wheels, production and sales of the Mustang GT fell significantly again in 1991 - as a matter of fact, it fell to an amount below the introductory 1982 GT sales level of 24,799 (the first time in nine years). In spite of this, the Mustang GT was still heralded by the press as one of the best “bang-for-the-buck” performance cars sold in the USA. 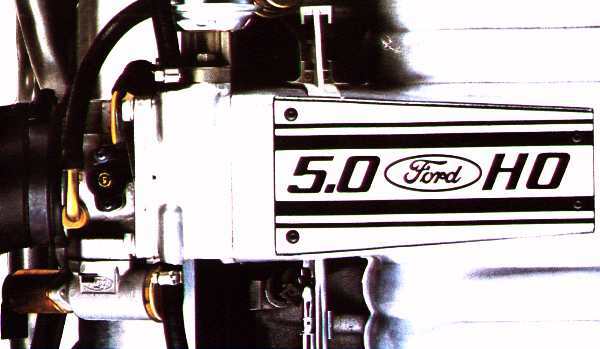 At the heart of the ‘91 GT was that old friend - the 5.0L HO - complete with all the bells and whistles from the prior year: a mass airflow sensor, 60mm throttle body, tuned length aluminum intake plenum, 19 lb-hr injectors, E7TE truck heads, roller lifter cam, remote low-restriction air cleaner, and EEC-IV electronics system. Also found as standard equipment once again were the GT’s stainless steel exhausts teamed up with stainless steel tubular headers, 10.84-inch front brakes and the GT handling suspension consisting of progressive rate springs, 1.3 inch front anti-sway bar, 0.83 inch rear anti-sway bar and gas pressurized struts with rear quadra-shocks . To complement the new 16 inch wheel, P225/55ZR Goodyear uni-directional Gatorbacks were standard with P225/55ZR16 all-season performance tires becoming an option. In addition, different front fenders were installed to accomodate the bigger wheel/tire combo. Also new for ‘91 was a lower convertible top stack height which smoothed out the convertible’s top-down profile. 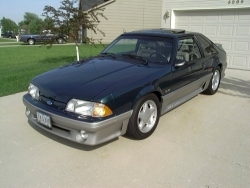 Externally, nothing else changed for the ‘91 GT and it retained its flush-fitting headlamps, aerodynamic nose, rear wing, round fog lights, louvered taillights, flush rear quarter window and ground effects package. Four new paint colors for ‘91 GTs were introduced: Medium Titanium Clearcoat Metallic, Titanium Frost Clearcoat Metallic, Deep Emerald Green Clearcoat Metallic (all 3 with Titanium lower accent treatment) and Medium Red. The following paint colors carried over from ‘90: Wild Strawberry Metallic, Twilight Blue Metallic, Ultra Blue Metallic (all of these available with the Titanium lower accent treatment), Black Clearcoat, Oxford White and Bright Red. 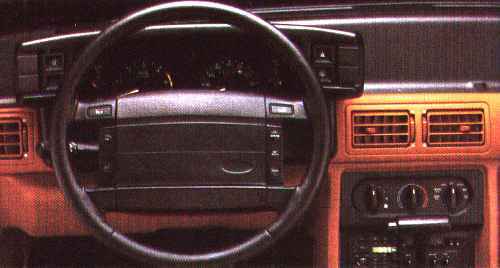 Inside, the basic GT interior carried over from 1990 with its 7,000 rpm tach, interval wipers, swiveling map light, articulated sports seats, center console, driver’s foot rest/ support and brake and accelerator pedals positioned to allow heel-and -toe downshifting. The only major interior change involved the introduction of a shifter lock-out on automatic models, requiring a foot on the brake to shift into gear from Park. This feature eliminated the under-column key release button on previous year’s automatics. Carryover interior trim colors were Scarlet Red, Titanium and Black with Titanium leather seats offered in the GT hatchback. The leather seat choices for the convertible GT were narrowed from four choices the previous year to three for ‘91 - black, white and red, or white and titanium with white and blue being discontinued. After an absence of two years, the 7 band graphic equalizer was back on the options list along with power locks and windows, speed control, dual remote mirrors, air conditioning, sunroof, rear defrost and electronic AM/FM stereo with cassette. A cargo tie-down net for the rear hatch area was also a new option for 1991. 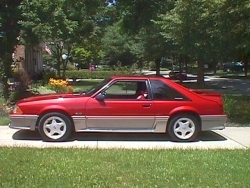 With its growing legion of die-hard fans, the Mustang GT had become something of a legend by 1991. 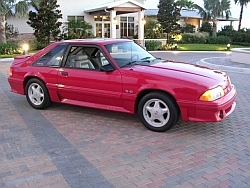 It had gained the respect of Mustang lovers young and old with its continuing tradition of rear wheel drive and V8 power. This area is still under construction. Please stop back in the future for a listing of 1991 GT options and prices as well as other data.